This round of Little List of Reviews is all about children’s books! Two of them are rereads of some of my favorites and one is something I read while on breaks at work because I left my current read at home! Matilda is a brilliant and sensitive child, but her parents think of her only as a nuisance. Even before she is five years old, she has read Dickens and Hemingway and still her parents think of her as a pest. So she decides to get back at them. Her platinum-haired mother and car salesman father are no match for her sharp genius, and neither is the cruel headmistress Miss Trunchbull. And then the child prodigy discovers she has an extraordinary magic power that can save her school and especially the lovely kindergarten teacher, Miss Honey. I’ve read Matilda a lot over the years, and each time I return to it I find something new about it I liked. The last time I read it before this current time, I read it for a course in British children’s literature while studying for my master’s degree, and we looked at how adults try to present the world of children and to try to view adults through children’s eyes even though they are no longer adults. 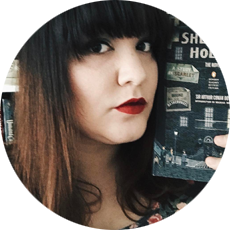 This time I noticed a lot of the criticisms of the world and its preoccupation with the media and with anything but learning and intelligence and how reading makes you more empathetic and socially aware. Matilda is precocious. She’s smart, witty, and loves learning about anything and everything. Her family, on the other hand, is more concerned about the appearance of social status, money, and the television rather than trying to do any good for anyone else in the world. When it was published, televisions were probably in nearly every household, computers were becoming more and more affordable, and the question is, what happens to intelligence and wisdom and using it for good when we have an idiot box or two talking to us constantly, telling us who we are, what we should like, and how we should like it. 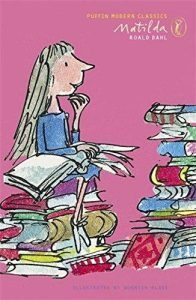 It’s a timeless read, and we should all try to find our inner Matildas and listen to her now and again. 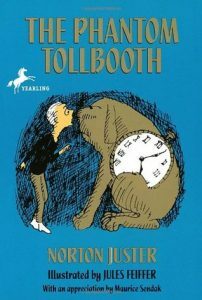 Every time I revisit The Phantom Tollbooth, I’m reminded how often children’s books aren’t always written for children, but for the adults who might be reading aloud to their children. Not much happens in the book in regards to plot or character development, and I think that’s all right. It’s a bit of whimsy to distract you from whatever you’re going through. The book itself is its own phantom tollbooth from reality to a bit of fun. It’s a collection of abstract language, puns and witticisms that seem to make sense once you’re older and have spent time in the world and may actually want a real life phantom tollbooth to escape things and to force you to change your perspective on the world once you’ve returned. I read this on my breaks at work one day because I was so drawn in by the over because Harper, the main character, has a cat companion and is given a magical umbrella. One day, Harper discovers that all of the cats in the city goes missing, and she decides that she’s going to find out why. 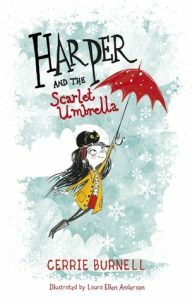 With the help of her friends and her magic umbrella, Harper discovers a Midnight Orchestra with every kind of cat on different kinds of instruments and must rescue them from the strange, slightly scary conductor. It was a lot of fun to read and I kept showing it to my coworkers, mostly because the illustrations of the girl and the cats were so cute!